Raven is a seasoned hospitality professional and alumnus of Soul Fire Farm’s Black-Latinx Farmer Immersion. She also participated as a member of the Kitchen Team for the first BLFI facilitated in Spanish and is a proud member of the Northeast Farmers of Color Network. Her motivation for co-founding Love Fed Initiative is rooted in her unwavering belief that healthy and affordable food and safe environments are a human right for all. 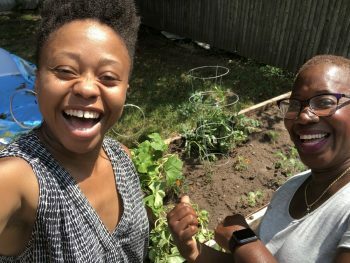 Founded in the spring of 2018, Love Fed [New Haven] Initiative completed 5 home farms in New Haven and educated over 200 children about urban agricultural and intuitive cooking. As Director, Raven facilitates after-school and family-oriented cooking classes and is currently looking to find more funding and hold action-planning workshops with the community to program for Love Fed’s next growing season.